Former KGB- FSB officer Alexander Litvinenko alleges that PKK's leader Abdullah Öcalan was trained by KGB- FSB. 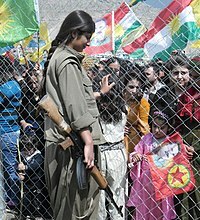 As of 2008, Russia is still not among the states that list PKK as a terrorist group despite intense Turkish pressure. Various PKK leaders, including Hidir Yalcin, Riza Altun, Zubeyir Aydar, and Ali Haydar Kaytan all lived in Europe and moved freely. The free movement was achieved by strong ties with influential persons. Danielle Mitterrand, the wife of the former President of France François Mitterrand, had active connections during the 90s with elements of the organization's leadership that forced a downgrade in relationships between the two states. After harboring him for some time, Austria arranged a flight to Iraq for Ali Rıza Altun, a suspected key figure with an Interpol arrest warrant on his name.. Turkish foreign minister Abdullah Gül summoned the Austrian ambassador and condemned Austria's action. On 30 September 1995, while Öcalan was in Syria, Damascus initiated contact with high-ranking German CDU MP Heinrich Lummer and German intelligence officials. The Chief of the Turkish General Staff during 2007, General Yaşar Büyükanıt, stated that even though the international struggle had been discussed on every platform and even though organizations such as the UN, NATO, and EU made statements of serious commitment, to this day the necessary measures had not been taken. According to Büyükanıt; " this conduct on one side has encouraged the terrorists, on the other side it assisted in widening their activities. " 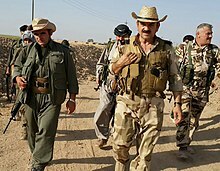 This page is based on the Wikipedia article Kurdistan Workers' Party; it is used under the Creative Commons Attribution-ShareAlike 3.0 Unported License (CC-BY-SA). You may redistribute it, verbatim or modified, providing that you comply with the terms of the CC-BY-SA.